Puffins are known to give any spectator entertainment. Thought of as clowns, these delightful little birds of the air are real characters. With their short wings, fat bodies and colorful beaks they are a real attraction to anyone visiting the Scottish Highlands. Each year, about a million puffins suddenly appear from the open ocean to get to their breeding grounds. In early April they start congregating around their breeding sites; a burrow, either dug out of the soil, or amongst the rocks. In May the Puffin lags its one egg and in the month of June and July they are at their largest numbers as they spend all their time diving into the waters for fish and searching for sand eels to feed their chick, usually early in the day and in the evening. 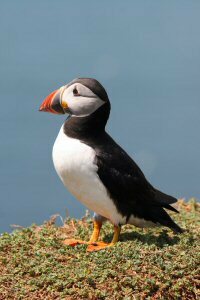 August time the puffin has finished on the island and has gone back out to sea. Getting a really good sighting all depends on whether they have nested on inaccessible cliffs for instance but you can usually guarantee a sighting in the right areas and in the right season. Marwick Head on Orkney, the coast around John O'Groats, Durness and Sutherland.